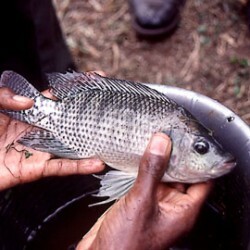 Now don’t get me wrong – Tilapia are a great fish choice for Aquaponics. After all, they are about the easiest fish I know of to breed at home. They eat almost any vegetable that you would put in the tank. They can gulp air and survive periods of low dissolved oxygen in a tank, and they also can handle HOT water temps. 1. Is it even LEGAL to keep Tilapia (in Texas)? There are four major species of Tilapia that can be kept for culture in Aquaponics: The Nile (Oreochromis niloticus), the Blue (O. aureus), the Mozambique (O. mossambicus) and the Wami (Tilapia hornorum). Of course, there are a now a huge number of hybrids out there that combine these different bloodlines into new varieties. Legal Issues in TEXAS — Currently, the only species of Tilapia that can be owned in Texas without an Exotic Species permit is the Mozambique. This is due to the fact that this species cannot overwinter in native waters. “Mossies” will die when exposed to water temps under 65-70 degrees F for a prolonged period of time. The current law also state that any fish that possesses any trace of the Nile or Blue bloodlines is “Restricted”. This means that an individual that wants to keep these fish must also apply for a TPWD Exotic Species permit. (More on that below.) The fourth species, the Wami Tilapia (T. hornorum) is expressly forbidden in Texas and any fish that contains any portion of that species CANNOT be owned in Texas legally, regardless of the permit applied for. The Exotic Species permit currently costs $263 for the initial application and must be renewed every year for an additional $27. The form itself is not very difficult to complete, but it does require several other permits/certifications. You will need to contact the Texas Commission on Environmental Quality (TCEQ) to obtain a wastewater is daily dose cialis on the tml formulary release certification and also the Texas Department of Agriculture (TDA) Aquaculture Facility permit. OK, so discussion about this, and similar concepts, has been going on for the past few weeks, I have to admit that it is actually almost completely true. Here is the skinny, direct from TPWD specialist Luci Cook, while it is legal to own Mozambique Tilapia for your own use on your own property AND it is legal to purchase them from an authorized dealer, there IS a law that clearly states that fish can only be transported by an authorized Fish Hauler. Now for the explanation: when this law was written in the late 1990’s, no one had really heard about Aquaponics. Therefore, the only reason to transport fish was for stocking in a pond or lake. Since all Tilapia are considered “Exotic Species,” it was necessary to make sure that things were done properly, therefore the law was written in such a way that a licensed Fish Hauler was required to be the one to transport the fish. With the recent surge in popularity of Aquaponics, many people are now wanting to keep small numbers of Tilapia for personal use in backyard systems. This is a problem due to the fact that this law is still in effect. What this means for anyone who wants to go buy some Tilapia fingerlings right now is that while they can legally purchase the fish and legally keep the fish at their home — that individual CANNOT legally drive the fish home! TPWD is currently working on a revision process that would allow for Mozambique fingerlings to be transported with a new version of the current “Transport” waiver. This document needs to be amended to allow for transport by a private citizen for personal usage. The hope is that this process will be completed before the end of 2013. Tilapia are an INCREDIBLY EASY fish to breed, and that means that many people think that they can make a couple quick bucks for themselves by selling their fingerlings. While I am not going to name anyone in particular, I can say that a quick search through Craigslist will yield anywhere from 3 – 10 individuals who are selling Tilapia fingerlings. I personally know a large number of the “legal” sellers in Texas, and I can say honestly that I have never heard of MOST of the individuals on CL. A few days ago, there was even a post from a facility in Florida that was selling Nile and Blue hybrids to Texas folks. When you buy your fish, be VERY careful — the onus is on you, as the purchaser, to ensure that you are following all of the required regulations and restrictions. I live along the Colorado River, East of Austin, and TPWD has added them to the river, to control duckweed, here. Where’s a good place to obtain stock in Texas? Preferably a place that I can choose a variety from. I do live a bit south of San Antonio. Rick, So what did you do? Online Training Is About To Reach New Levels! © Green Phoenix Farms 2019. Affluent theme by CPOThemes.